What is Bitcoin Web Hosting? 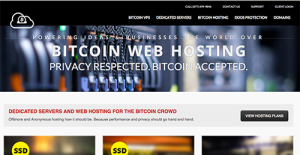 Bitcoin Web Hosting accepts payment in bitcoins, and offers shared hosting, VPS, and dedicated server plans. The highlight of this hosting service is it offers anonymous hosting with assured privacy. Bitcoin Hosting also offers DDoS protection, domains, SSL certificates, and managed hosting services. Bitcoin Web Hosting offers a 99.9 network uptime guarantee as well as 99.9% infrastructure guarantee, excluding scheduled maintenance. The company will replace any failed hardware components at no cost to the customer. Bitcoin Web Hosting uses high-perfomance, scalable servers in its data centers, as well as DDoS protection to protect customers’ websites from DDoS attacks. How Much Does Bitcoin Web Hosting Cost? Bitcoin Web Hosting offers cPanel for account management. The control panel offers more than 150 one-click installs. Every business has its own characteristics, and can call for a specific solution that will be designed for their company size, type of customers and staff and even particular industry they deal with. We advise you don't count on locating a perfect service that is going to be suitable for each company no matter what their background is. It may be a good idea to read a few Bitcoin Web Hosting reviews first and even then you should keep in mind what the hosting service is intended to do for your business and your workers. Do you need a simple and intuitive hosting with only elementary functions? Will you really make use of the complex functionalities needed by pros and big enterprises? Are there any specific integrations that are especially practical for the industry you work in? If you ask yourself these questions it will be much easier to find a trustworthy service that will fit your budget. We realize that when you make a decision to buy Hosting Services it’s important not only to see how experts evaluate it in their reviews, but also to find out if the real people and companies that buy it are actually satisfied with the product. That’s why we’ve created our behavior-based Customer Satisfaction Algorithm™ that gathers customer reviews, comments and Bitcoin Web Hosting reviews across a wide range of social media sites. The data is then presented in an easy to digest form showing how many people had positive and negative experience with Bitcoin Web Hosting. With that information at hand you should be equipped to make an informed buying decision that you won’t regret. Bitcoin Web Hosting offers 24/7365 support through email. The company promises an average response time of 30 minutes for support tickets. It does not seem to offer phone or live chat support. What are Bitcoin Web Hosting pricing details? Yes, Bitcoin Web Hosting fully supports the WordPress platform. Bitcoin Web Hosting accepts major credit cards, PayPal, MoneyGram, Western Union, and bitcoins. Yes, Bitcoin Web Hosting offers a free domain with select plans. This company uses high-perfomance, scalable servers in its data centers, as well as DDoS protection to protect customers’ websites from DDoS attacks. Bitcoin Web Hosting provides both Windows and Linux hosting services. Bitcoin Web Hosting offers cPanel for account management. Bitcoin Web Hosting offers a 99.9% network uptime guarantee, excluding scheduled maintenance. It gives a credit of 5% of the monthly fee for each 60 minutes of downtime and a credit of up to 100% of the monthly fee for the affected server. Bitcoin Web Hosting offers unlimited email accounts with all its shared hosting plans as well as unmetered bandwidth with the more expensive packages. Bitcoin Web Hosting sells SSL certificates on its website and its packages support e-commerce websites.